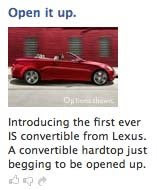 Lexus wants you to “Open It Up” according to their Facebook ad for the launch of the 2010 Lexus IS Convertible. I’m guessing they couldn’t go with “Pop Your Top”, so they found a nice PG-version of the phrase to get people excited about another hardtop folding roof from a luxury manufacturer. The CRM email piece is a little more understated as it just asks be "Open All Night". Oh wait, that sounds a bit odd too. 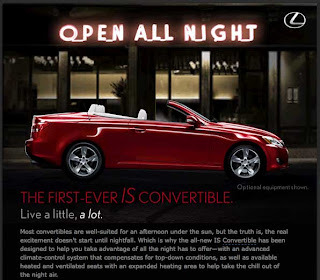 Regardless of when you open it all up, the new Lexus IS Convertible has arrived. The email campaign started yesterday and ads for the car appeared on Facebook today. Links from the ads, take you to the Lexus Future Vehicles section. Here there is a limited palette of colors to choose from, four to be exact. A couple videos show some nice beauty shots of the top retracting complete with spa-like music soundtrack. Lastly, a surprise, or at least it was for me, the new convertible is offering a F-Sport package that upgrades the car with many performance features including cross-drilled brakes, performance intake, sway bars and many other enthusiast goodies. I have to admit, I was taken aback by the F-Sport options. It is obviously Lexus’ answer to the new BMW Performance line that the Bavarians are promoting lately. The package does add an element to the Lexus convertible I was surprised to see Lexus pursue. The IS is a rather sedate, boring car. I drove a IS350 all-wheel drive for a couple days last year after bringing in my wife’s RX300 for some service at the dealership. The loaner IS I had was nice, but it was typical Lexus. Great materials, decent handling, and a peppy engine, but nothing I’d call out as performance. Sure there is the IS-F M3 fighter, but that seems like a much different beast than the standard issue IS. The IS convertible just doesn’t strike me as an enthusiast car for Lexus as I’m sure we’ll see tons of real estate agents, scratch that they’re broke, uhm… female doctors driving around in this car. The enthusiast culture of BMW owners is hard enough on us convertible owners (I drive a 2007 BMW 335i convertible), I can’t imagine how unconvincing a F-Sport IS convertible is to the performance crowd. So, it is an interesting product decision and it will be interesting to see if and how Lexus markets the IS beyond the top popping crowd. I find it odd that they are now heavily promoting this car and still lack a Build & Price feature to configure the vehicle on their website. Plus, driving customers to their Future/Concept website section gives the impression the car is some way off in the future and there is no communication about when to expect the Lexus IS convertible at dealerships. I also visit the face book there is ad for 2010luxus convertible. i found pg version of the luxury manufacture. Nicely written!